Women’s History Month and the 100th Anniversary of International Women’s Day March 8, 2011 – what a great month to toast the New Year. The name itself is an action, a call to action: MARCH – Move! Get those legs working and do something! I was in the OZONE Feb. 25-26, as Oakland toasted February goodbye and with it, Black history. Well actually, Feb. 25 at the Oakland Museum of California did just the opposite. With “resistance” as the theme of the evening – from the classic poster art of Emory Douglas and Faviana Rodriguez, to tasting revolutionary tortillas with cheese and Angela Davis on the outer shell, to roses for Rosa Park and a Huey (fig) Newton – all edible; a new line called consciously delicious – patrons had a multisensory experience at the museum, an idea which is a part of the OM motif. The place was full to capacity with patrons forming lines early for the special celebration “Soundtrack – the Drum” with Anthony Brown and CK Ledzekpo narrating, joined by the Stanford Steppers, the CAL Drumline from UC Berkeley and, as a special treat, Mr. Hambone himself, Derrick McGee. 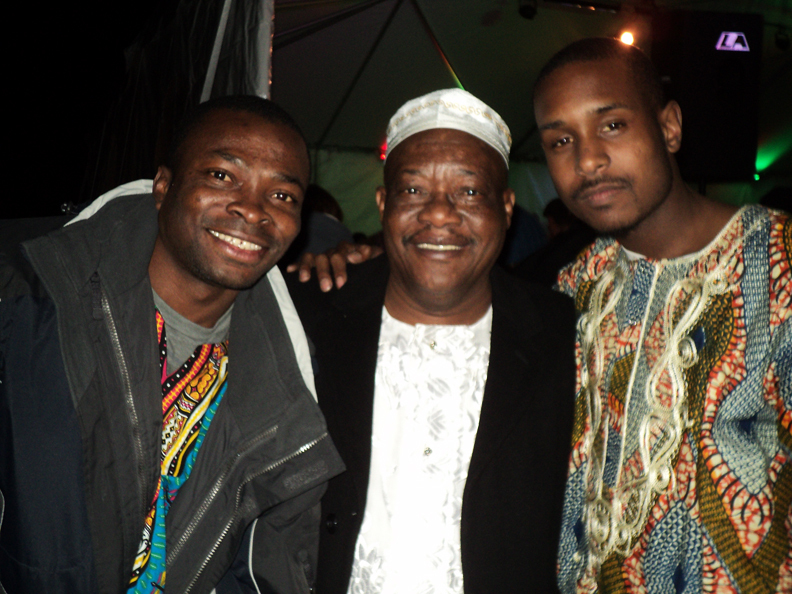 It was a wonderful walk from Africa to California – Oakland, to be exact (smile). Drums filled the stage – African percussion drums played by CK and students and/or members of his ensemble from East Bay Center for the Performing Arts and the trap drummer, another student of CK’s who is traveling to Boston to attend Berkley College of Music this summer. As CK explained the music he was playing and where in Africa it originated, dancers led by Mrs. Ledzekpo performed to the music. At one point the audience was invited to participate; I was one of the first persons on the floor – a cold night, dancing warmed me up. Duane Deterville gave a lecture on resistance in Black music, while a distinguished panel with former Minister of Culture Emory, artist Favianna, Carol A. Wells, Center for the Study of Political Graphics, and political poster historian Lincoln Cushing discussed art and politics. That room filled to capacity early and I couldn’t get in. 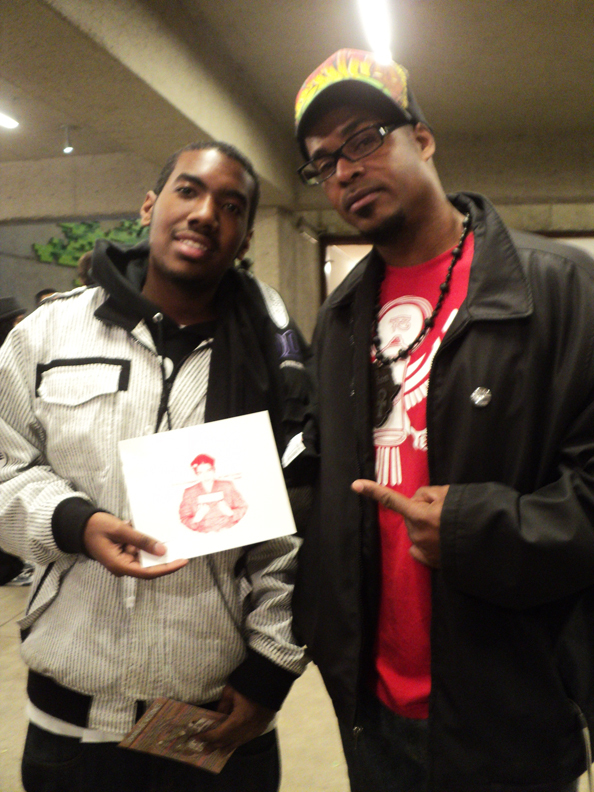 I met a brother named Jesus who is a visual artist. Refa One and one of the youth designers featured in the AeroSoul 2 Youth Exhibit, which is up through early March, said he explained to security that there were hardly any Black people in the room, and to tell two to four white people to leave so he and Malik, the young artist, could go inside. From what Refa shared, it sounds as if those persons in the audience really didn’t know how art can change minds, even hearts. Think about the power of music to “soothe the savage beast – right? The brother coming out of the lecture looked like a work of art, as did his striking friend. Most of the events repeated at least once. The only problem was I was attending another event at the same time. Then as one walked between classrooms, the tent, or the Blue Oak café – there were art stations where one could silkscreen a political poster. I made three: Nina Simone singing “Mississippi Goddam,” another “Free the San Francisco 8,” the last one a poster celebrating the end to tyranny in North Africa. Across from that very popular table at any given moment there were two and three clothes lines filled with posters drying. There was another artist across the way doing spray can art. His image was of the WikiLeaks founder. What was interesting was watching him apply the multiple layers. The Oakland Standard Poster Jam participants were the San Francisco Print Collective, Great Tortilla Conspiracy, Eddie Colla and Jesus Barraza. 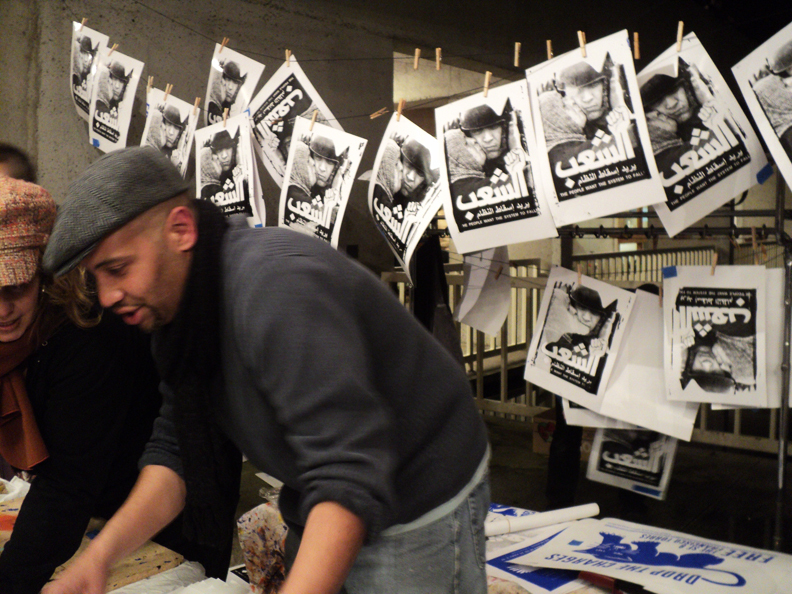 Patrons were able to silkscreen posters with Nina Simone, “Drop the Charges SF 8: Francisco Torres” and “The People Want the System to Fall” with a woman kissing the cheek of an Egyptian soldier. There were postcards with actions planned for the next month and an e-list. The finale was the Lagos Roots Afrobeat Ensemble featuring members of Fela Kuti and the Africa 70, Sonny Okosuns and others. DJ Wonway Posibul with a live percussionist was excellent – his jams were right on. In the café, there were board games out for people to play from 9-11:30 p.m. I missed Bill Bell and the Jazz Connection Trio with Eddie Marshall on drums and Jeff Chambers on bass. I heard they were fantastic! The new exhibit “Splendors of Faith/Scars of Conquest” was pretty gruesome especially in the graphic details of the crucifixion. I had to turn my head on some, the torture too unsettling. I wonder why in Oakland would there be such a large exhibition on missions – that’s like celebrating the various slave dungeons where Africans were held captive before being shipped to other lands. Most of the missions are further south and of course in San Francisco to Oakland’s west. Missing was the African Diaspora use of Catholicism to practice Ifa, big in Oakland presently and in California. In the section which I enjoyed the most there was nothing and within the exhibition itself I didn’t see an African presence or perspective at all. When one thinks about California, named for an Amazon Queen Califia, one has to consider the impact of missions or Catholicism on African people in California. I recently completed Tananarive Due’s historic novel, “Black Rose” (2001), drawn from the research on Madam C.J. Walker that Alex Haley began before he passed. “Black Rose,” a pet name Madam Walker’s second husband, C.J., called her, is a wonderful testament to the first Black woman millionaire, whose parents were enslaved Africans. I place this book up there with Dorothy Height’s autobiography, “Open Wide the Freedom Gates” (2003). Due will be at Medgar Evers College in Brooklyn, March 28, 11-5, for a Writer’s Conference which invites writers to the table to honor the work and legacy of speculative fiction writer Octavia Butler (June 22, 1947-Feb. 25, 2006). For information, contact writers@mec-cuny.ed or (718) 270-6976. Queen Makedah, Sistah Beauty and Irae Divine were on my radio show Friday, March 25, 9:30 a.m., speaking about their upcoming tour in honor of International Women’s History Month, March 2011. Oriyah Music presents the Empress Meditations West Coast Tour, a series of presentations featuring live performances by the three women with the Sheba Warriors all-star band, plus the cream of local female DJs, spoken word, and dance competitions. The purpose of the tour is to spotlight conscious female artists in reggae music whose music speaks to the historical cultural contributions of women from antiquity to the present day and addresses issues pertinent to women and the family unit. Their first stop is Santa Cruz, March 2, 9 p.m., at Moe’s Alley; then March 5, at Pier 23 Café in San Francisco, 9 p.m.-2 a.m., (415) 362-5125. The March 5 gig is also the Second Annual International Women’s Day Benefit for the Family Violence Law Center of Alameda County. Yoshi’s San Francisco is a stop on the tour, March 30, 9 p.m. to 2 a.m., and the closing show is March 31, 9 p.m. to 2 a.m., at Ashkenaz Music and Dance Center, 1317 San Pablo Ave., Berkeley. For more information on the Empress Meditations Tour, visit www.queenmakedah.com and www.blogtalkradio.com/wandas-picks (Feb. 25, 2011). “Transformative Visions 2011: Lifting Up Visions of Peace, Justice, and Possibility” is Saturday, March 12, 2-5 p.m., at Studio One Art Center, 365 45th St., Oakland. Visit http://www.onelifeinstitute.org/. Diamano Coura West African Dance Company presents its 16th Annual Collage des Cultures Africaines at Malonga Casquelourd Center for the Arts, 1428 Alice St., Oakland, and Laney College, 900 Fallon St., Oakland, Thursday-Sunday, March 10-13. Workshops are at MCC and the performance, “Celebration of the Mask,” is Saturday evening, March 12, 8 p.m., at Laney College Theatre. The marketplace opens at 6 p.m. March 12. For information, contact (510) 508-3444 or diamanoc@aol.com. Dimensions Extensions performance ensemble presents its Seventh Annual Fundraising Concert, “Something to Be Proud Of,” Saturday, March 19, 7 p.m., at the Malonga Casquelourd Center for the Arts Theatre, 1428 Alice St., Oakland. Tickets are $40 Thursdays and Fridays and $50 Saturdays and Sundays. Thursday performances are at 8:30 p.m.; Friday and Saturday performances are at 8 p.m.; Sunday performances are at 2 and 7 p.m. Discounts are available for groups, students and seniors. Preview performances will be held on March 3 and 4 with the opening on Saturday, March 5. Sundays, March 6, 13 and 20, will be Target Family Matinées, where all seats will be half price, $25. “Fabulation” will be presented at The Southside Theater, Fort Mason Center, Historic Building D, San Francisco. For more information, ticket availability or to subscribe, call (415) 345-3980 or visit www.LHTSF.org. This March, Berkeley Repertory Theatre proudly presents “Ruined,” winner of the Pulitzer Prize for Drama. A powerful new play about the harrowing lives of women in Africa, “Ruined” is written by Lynn Nottage and directed by Liesl Tommy. A collaboration between Berkeley Rep, Huntington Theatre Company and La Jolla Playhouse, this production has already earned seven awards – including Outstanding Dramatic Production – from the San Diego Critics Circle. It begins previews in the state-of-the-art Roda Theatre on Feb. 25, opens March 2 and closes April 10. Tickets to “Ruined” start at only $29. Additional savings are available for groups, seniors, students and anyone under 30 years of age – meaning discounted seats can be obtained for as little as $14.50. These prices make Berkeley Rep more affordable to people in the community who are just starting school, starting careers and starting families – because lower prices are now available for every performance. Tap into the power of “Ruined.” The Roda Theatre is located at 2015 Addison St., near bus lines, bike routes and parking lots – and only half a block from BART. For tickets or information, call (510) 647-2949 or toll-free at (888) 4-BRT-Tix – or simply click berkeleyrep.org. Eastside Arts Alliance presents “The Grassroots Composers Ensemble” in concert every first Friday – this month, Friday, March 4, 8 p.m. Admission $10. ESAA is at 2277 International Blvd., Oakland, (510) 533-6929. Under the direction of trumpeter Mark Wright, featuring pianist Muziki Roberson and the inimitable stylings of Mack Rucks, Dr. James Bailey, Joe McKinley, Greg Germain and featured guests, these home grown jazz artists have been composing and arranging original and classic jazz compositions for five horns for the past six or seven years. These dedicated artists meet religiously every Tuesday night at the digs of Muziki Roberson. The music is fresh and exciting. Please come out and support them and also pass the word on. The Eastside Arts Alliance is a gem in our community, offering music, dance, spoken word and theater with a level of consciousness unparalleled in our community. They also sponsor the annual FREE Malcom X Jazz Festival. Let’s support them in a venue that is family friendly with reasonable admission. Light refreshments and drinks available for purchase. Anna Maria Flechero at Yoshi’s Oakland on March 1 for one show, 8 p.m. I had her on my radio show, www.blogtalkradio.com/wandas-picks, maybe two years ago. She was speaking about fundraisers and shows leading up to the Filipino-American Jazz Festival in San Francisco that year. KPFA and KPOO radio personality Avotcja is the host. Multi-talented song stylist and songwriter Anna Maria Flechero brings to the jazz stage original compositions and well-known jazz standards with the release of “Special Edition: Journey into the Fourteenth Hour.” Accompanying Ms. Flechero for the evening is Little Brown Brother featuring Vince Khoe, piano; Ben Luis, bass; Chris Planas, guitar; Marlon Green, drums; Mio Flores, percussion; and Eddie Ramirez, horns; with special guest vocalist, contralto Myrna Del Rio. Ashford and Simpson’s exclusive Bay Area appearance, “The Real Thing,” is Tuesday-Friday, March 29-April 3, at the RRAZZ Room in Hotel Nikko, 222 Mason St. at Ellis, in San Francisco. Visit www.therrazzroom.com. Alvin Ailey Dance Theatre makes its annual sojourn to Cal Performances on Tuesday–Sunday, March 29-April 3. The three distinct programs include three premiers. The first of two Bay Area premieres is “Anointed” (2010), choreographed by Christopher L. Huggins in tribute to those who have led the Ailey company past, present and future; “Cry” (1971), the second work new to Berkeley, was choreographed by Alvin Ailey for Judith Jamison and is dedicated to “all Black women everywhere – especially our mothers.” The West Coast premiere of “Three Black Kings” (1976) is the last major work composed by Duke Ellington for Alvin Ailey. 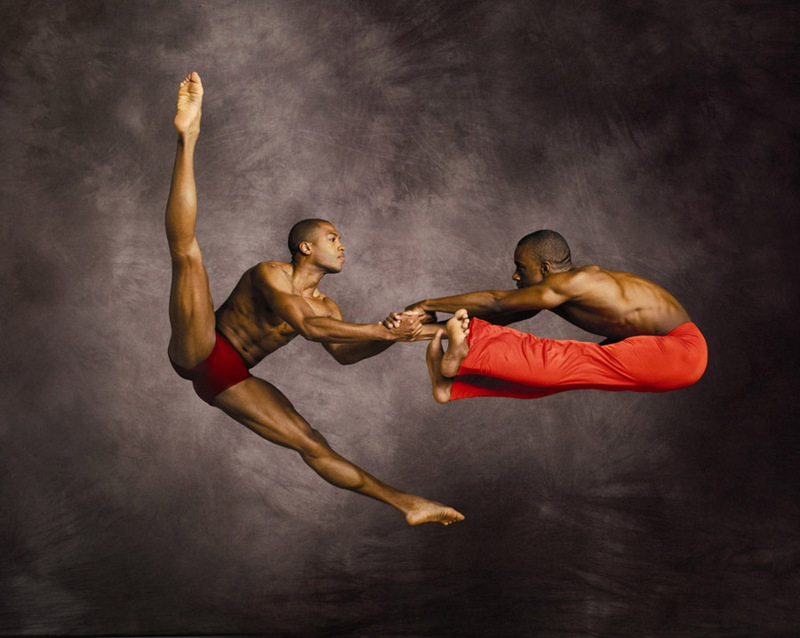 Every program presented will also include Alvin Ailey’s timeless “Revelations,” now celebrating its 50th year. This season marks the end of an era: Judith Jamison steps down as artistic director after more than two decades of exceptional leadership. Under Jamison’s guidance, the company has thrilled tens of millions of people on six continents, has been recognized by Congress as “a vital American cultural ambassador” and serves as an enduring vehicle for the expression of the African-American experience. Choreographer Robert Battle is artistic director designate. Tickets are available at (510) 642-9988 to charge by phone, at www.calperformances.org and at the door. For the school matinee, tickets are $4 per student or adult chaperone, available in advance only through Cal Performances at (510) 642-1082. SchoolTime performances are open to students in kindergarten through grade 12 in Bay Area public and private schools. Supplemental study guides for the classroom are provided. For more information about the SchoolTime program, contact the SchoolTime coordinator at Cal Performances by email at eduprograms@calperfs.berkeley.edu or by phone at (510) 642-0212. “The Unsayable” will be presented by Hope Mohr Dance and “She Dreams in Code” by guest Liz Gerring Dance Company Thursday, March 3-6, at Z-Space, 450 Florida St., San Francisco. Tickets are available at brownpapertickets.com or 1-800-838-3006. All shows are at 8 p.m. except Sunday, March 6, there’s a 2 p.m. matinee with a post show Q&A on veterans’ issues. Friday, March 4, is an artist talk. Written by Dolores Prida, directed by Tania Llambelis, “Coser y Cantar” asks the question: Can we survive walking the tightrope of desire strung over two separate languages and cultures? “Coser y Cantar” opens March 17-19 at 8 p.m. at the Mission Cultural Center for Latino Arts, 2868 Mission St., San Francisco, (415) 821-1155 or www.missionculturalcenter.org. Take BART to the 24th Street Mission Station. I first learned of St. Jude’s work with children through a series of love and hope novels by Black women romance writers, Sandra Kitt’s “For All We Know” and Gwynne Foster’s “What Matters Most” (www.novelsofhope.org). It was a pleasant surprise last year to find out about the second annual gala, which is now having an encore this month, Thursday, March 17, 8 p.m., $75-$175, for St. Jude Children’s Research Hospital. This is the premier nightclub of the West Coast celebration with a star-studded lineup including Sarah Dash, Joyce DeWitt, Sally Kellerman, Florence LaRue, Gloria Loring, Deana Martin, Melba Moore, Kim Nalley, CeCe Peniston, Martha Reeves, Paula West, Edna Wright and Honey Cone and Pia Zadora. Visit http://conta.cc/hHSzca and https://www.vendini.com/ticket-software.html?t=tix&e=a0c5d4086f7c093bd39316fcd9f23a9e. Branford Marsalis and Terence Blanchard are in town Friday, March 11, 8 p.m. at UC Berkeley’s Zellerbach Auditorium. There is a free Lobby Talk at 5-6 p.m. with UC Berkeley Jazz Director Ted Moore. Sunday, March 6, Balé Folclórico da Bahia are back for one performance, 7 p.m. at UC Berkeley’s Zellerbach Auditorium. Chuy Varela hosts the Lobby Talk 4-5 p.m. Les Percussions de Strasbourg, March 13, 3 p.m., in Hertz Hall looks interesting. Visit www.calperformances.edu. The sidelines talk is 2-2:30 p.m. Cheryl West’s play, “Jar on the Floor,” directed by Buddy Butler with C. Kelly Wright and other stars in the cast, opens Feb. 26 and continues through March 6 at Mexican Heritage Theater, 1700 Alum Rock Ave., San Jose. Visit www.acteva.com/go/sjmag or call (408) 272-9924. This production celebrates SJMAG Tabia African American Theatre Ensemble’s 25th Anniversary. “What do the Women Say? 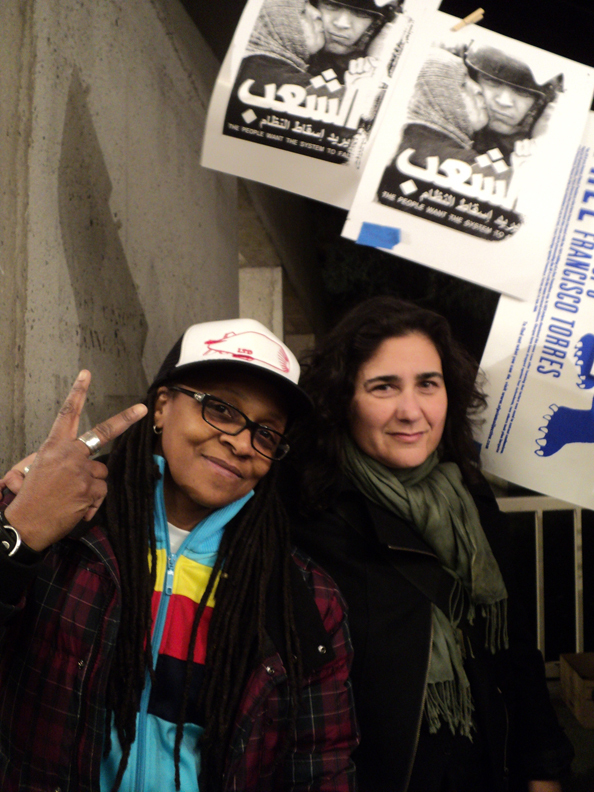 An Evening of Poetry and Performance by Women of the Middle East,” is Tuesday and Wednesday, March 8 and 9, at La Peña Cultural Center, 3105 Shattuck Ave., Oakland, www.lapena.org. Nicole Klaymoon Embodiment Project, Friday-Saturday, March 24-25, 8 p.m., with special guests Byb Chanel, Valerie Troutt, Makana Muanga and others at La Peña Cultural Center, 3105 Shattuck Ave., Oakland, www.lapena.org. “Words First,” a monthly solo showcase, is March 2, 7:30 p.m., with “How the hell did we get here? !” Unhappy endings … with a twist, with performances by Vanessa Lee Khaleel, Ericka Lutz, Howard Petrick, and Sarah Weidman. Visit http://counterpulse.org/programs/words-first. CounterPulse is located at 1310 Mission St.
Paula West and the George Mesterhazy Quartet have their annual RRazz room engagement Tuesday, March 1, through Sunday, March 13. Check the show times, which vary. Visit the RRazz room at Hotel Nikko, 222 Mason St. at Ellis, in San Francisco. Tickets for Performances at the RRazz room are available at www.therrazzroom.com and (800) 380-3095. Visit www.moadsf.org for their programming related to the current exhibition celebrating jazz and quilts. With Mardi Gras almost here, the lecture and performance “West Africa to New Orleans: African Masking Traditions” with New Orleans native Shaka Zulu is Sunday March 13, 2-4 p.m., is sure to be a hit. Visit www.blogtalkradio.com/wandas-picks for interviews with many of the artists mentioned here and others who are not (smile). Live shows are Wednesdays, 6-7 a.m. PST, and Friday mornings, 8-10 a.m. PST. Disney on Ice’s “Let’s Celebrate” reaches Oakland March 2, 7:30, all seats $15. Join Mickey Mouse and Minnie Mouse on a magical journey through the holidays with 52 characters from 16 Disney stories, one of them “The Frog Prince” with Princess Tiara. I interviewed Farryn Johnson on Friday, Feb. 4. Visit www.blogtalkradio.com/wandas-picks and look in the archives for the interview. Check San Francisco Performances website too, at www.performances.org/education/calendar.html. One could tell the kids were into it – by kids, I don’t means children, just neophytes to Liberation Struggles getting their collective awakening Friday night at the Oakland Museum’s OZONE. Without the acid rain, snow, clouds or high winds the O was certainly in a zone, scientifically unspecified. Laying it on with a spatula, as in thick and indelibly stuck to all in the ZONE that night. The DJs were spinning all the hits from a time when lyrical content meant original unsampled thoughts … well, I take that back; nothing is original. Just like the air we breathe and the land we occupy, it is all dead and reborn. Like the revolutionary fever sweeping the planet, the O was a pot flavored and simmering with the spices present that evening. Have you even had air stuck in your esophagus and couldn’t get a good enough belch? That was the O. Some call it the last days, others indigestion. The planet has had enough and now all its inhabitants have declared or put the lords and ladies on notice: The people are taking over! Linguistically, the Oakland Standard’s OZONE (OS launched January 2011), one of its programs, continues thematically. It’s all about opening the space to art which is kinetic, participatory, useful – wear it, feel it, do it, be it! Art is not for lazy minds or innocents lost – perhaps it is, but for the active mind or citizen, those people who generally find themselves in museums in the first place, reluctantly as kids and then selfishly as adults, the Oakland Standard concept makes art a part of life for those who really enjoy living, really living as free citizens of Oaktown and Oak-Universe. Prophet Fred Wilson’s museum space sojourns says this. He also speaks with his work to the exclusion of certain audiences when one talks about museums and other “high art.” OZONE is a way to demystify such phenomena. The audience was predominately white, even though the material or presentations were about the Black aesthetic, yet typically the subjects were absent. There wasn’t even consideration given to the few Black folks in the audience that evening – we couldn’t get into major lectures and concerts. This would have been OK if the sound had been broadcast and if there had been a video simulcast – in the past, the Oakland Museum always provided such, especially for programs where it expected large audiences. African people do not like the cold and the idea of standing in a line for 45 minutes was a turn off to many elders, who left early. At midnight the majority of folks still at OM were 30 and younger, unless they were working and white. Consciousness is hard work, yet it can be fun and in its second program since launching Oakland Standard, OZONE proves that yes, consciousness is the only way to live a life fully committed to justice as a revolutionary or change agent. Similar to programming at Yerba Buena Center for the Arts, Oakland Standard, as its premise, shouldn’t toss out what worked in the past. New doesn’t mean nothing old allowed: people, ideas, customs. I guess with the new exhibit on Our Lady of Guadeloupe, the old suffering Christ – nailed to a cross, bleeding – is an image I couldn’t stomach. However, the newer images of this mysterious patron saint, a way of flipping the colonial baggage into something not just new, but liberating, is what I see Oakland Standard providing for its East Bay constituency – if they are extended the proper invitation. I saw a few parents with their children out for the evening, but not enough. I know the museum has its Family Sundays which are kid-friendly, early in the day and often outdoors. Some audiences don’t come if you open the door; you have to go get them. Audience development is still a weak area for many presenting organizations like Oakland Museum, which has ethnically specific community advisory boards. I suggest OM solicit their expertise. There was no reason why there were not more Black youth ages 15-25 in the OZONE, especially for “Soundtrack: The Drum” and the Oakland Standard Conversation, not to mention the Oakland Standard Political Poster Jam. Even the Game On! was a place for families and friends to sit around and talk, not to mention the open galleries where in Art History in the back I heard a woman interviewed for her Oakland Story, a program of Story Corps. Standard implies a flag or flagship idea which is self-promoting; carry it long enough and it becomes you. Certainly Oakland needs a new standard and with a new mayor and a revised vision for an Oakland institution, the Oakland Museum of California, the concept is timely and necessary. But historically Oakland seems to be receding from focus. After all, museums are nothing without people – human beings are the greatest work of art imaginable. The African presence seems the first to go when institutions are formed or changed. I am rattling the cage so OM doesn’t follow in the footsteps of its many predecessors. The 29th Annual San Francisco International Asian American Film Festival (SFIAAFF), a presentation of the Center for Asian American Media, showcases the best Asian films from around the globe between March 10-20, in San Francisco, Berkeley and San Jose. Films screen in San Francisco at the Castro Theatre, 429 Castro St.; Sundance Kabuki Cinemas, 1881 Post St.; VIZ Cinema, 1746 Post St.; and the Landmark Clay Theatre, 2261 Fillmore St. In Berkeley, go to the Pacific Film Archive, 2575 Bancroft Way. And in San Jose the festival is at the Camera 12 Cinemas, 201 South Second St. and the Montgomery Theater, 271 South Market St. in San Jose. For tickets and information about CAAM membership benefits and levels, please visit www.caamedia.org. Other superlative offerings representing a sampling from the region include narrative features, “The Taqwacores,” from Eyad Zahra, a rock epic about the Muslim punk rock movement; Mani Ratnam’s “Raavanan,” a modern re-telling of the epic Ramayana legend starring megastar Aishwarya Rai; and the documentaries “Summer Pasture” by Lynn True and Nelson Walker, which pits the seductiveness of modernity against traditional pastoral life in Tibet, and “Made in India” by Vaishali Sinha and Rebecca Haimowitz, an illuminating tell-all about outsourced surrogacy in India. As part of the festival’s beefed-up interactive programming, there will be a panel on the exciting developments in Indian cinema, “Stepping Forward, Looking Back.” Experts will discuss international collaborations, the emergence of independent works, and what these new developments mean for financing and distribution. SFIAAFF will also present a prototype of the CAAM-produced game, “Climbing Sacred Mountain,” based on the film, “Daughters of Everest,” which documented the first Nepali women’s expedition on the highest peak in the world. The game will be part of CAAM’s inaugural independent games exhibition and the related panel, “The Power of Play.” Rounding out the live events will be “Bollywood Under the Stars,” a free screening at the close of Festival Forum. Excluding special events, panels, galas and special screenings, advanced general admission tickets are $12. Students, seniors 65 and over and disabled adults are $11, with a limit of one per program with ID only. Center for Asian American Media members are $10, limited to two per program per ID. Tickets go on sale to CAAM members only on Thursday, Feb. 10, and open to the general public beginning Monday, Feb. 14. Become a member of the Center for Asian American Media and start receiving discounts on tickets for the festival, avoid all processing fees and get tickets to the films you want before they go to rush. “Free the San Francisco 8"
“Special Edition: Journey into the Fourteenth Hour"
“West Africa to New Orleans: African Masking Traditions"
Something to Be Proud Of"
Previous articleWhat we need is our 40 acres and a mule! Après la lecture de votre article, l'équipe de graphistes strasbourg de CERA interactive approuve votre travail de qualité ! Sur notre site internet, nos graphistes vont bientôt soumettre un travail sur ce même sujet. CERA interactive approve your good article ! On our web site, our graphic designers will soon submit a work on the same subject. Will My heart ever be able to hear the sound of the temple bell which blessed that This pair will never be separated. How will I search for you with these moist eyes…? thanks for sharing mate really loved it.Jio TV for PC and hipstore pokemon go and tubemate for IOS and snaptube ios download and terrarium tv IOS thanks a ton. Thanks for sharing. Visit My Blog For Latest Tech News All Info Updates And many More Bollywood, Lifestyle News. bigg boss season 11 contestants we are sharing all details check it out here..
for more news best article..
i liked it admin your post awesome post sharing. about foosball table review check it out here.